I thought I would indulge in another issue of The Sunday Post since I had so much fun putting it together last week! The Sunday Post is a weekly meme hosted by Kimba @ Caffeinated Book Reviewer, and it is a chance to share some weekly news. This is a chance to recap the past week, showcase some books and other things you may have received, or maybe talk about what is coming up for the week on your blog. (Although I am not much of a planner, so instead let me talk your head off about my flu and show off my bookcases! So. It finally happened. It has been two years since I have been legitimately – called out of work – sick. I have felt pretty awful all week, but I will say that as I have gotten older, I have gotten to be a much better patient. So, I’ve diligently taken my medicines, tucked myself into bed early, and eaten only soup and tea for five days straight. I feel weak as a kitten, but I am definitely on the mend! I was also having some caffeine withdrawals since I couldn’t have my daily cup (s) of coffee, which got me thinking: how the hell do you all that don’t drink coffee do it? It is my life source, my legal drug, and I am unashamed to admit that I live for it. Random thought, but just wanted to share. Lastly, in mostly book related news, I got my FairyLoot in this week and it was such an awesome box! I was too ill to do an unboxing on my Instagram story, so I let Nicholas have his five minutes of camera time, and he loved it. If you missed out on the antics, don’t worry, I think he will be taking over all my unboxings for now on! The good thing about being sick is that I did get a lot of reading done! I finished both books of the Passenger series by Alexandra Bracken: Passenger & Wayfarer. 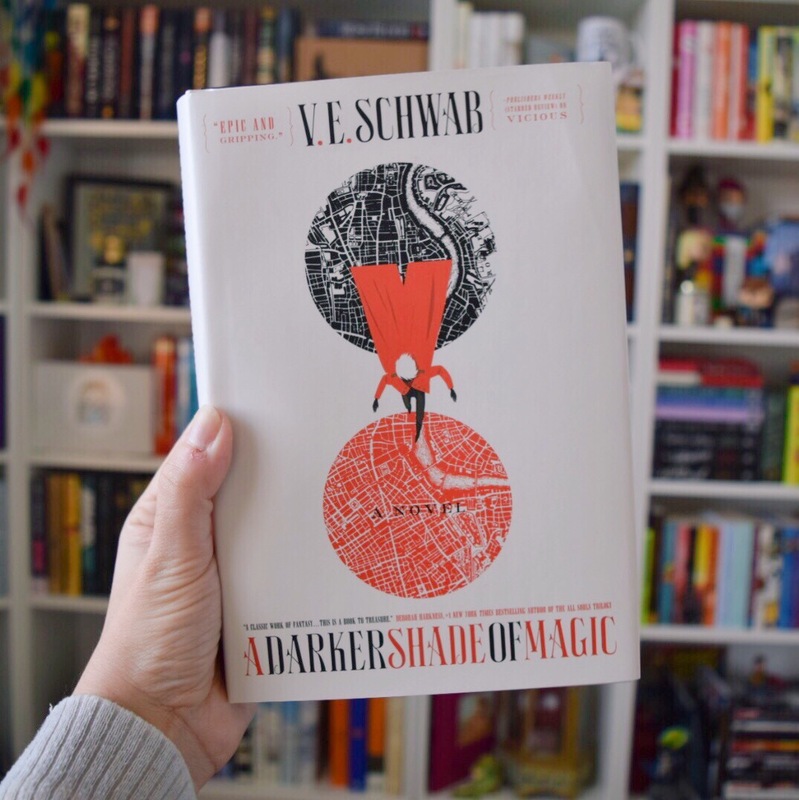 I put together a stack of books I wanted to read this month, and since its only the fourth I decided to not yet stray from the stack, and picked up A Darker Shade of Magic. I have been wanting to read this series for a year and I am excited to finally start! I wasn’t super active on the blog this week, but I did manage to partake in Top 10 Tuesday for the first time in weeks, which you can check out HERE. I am actually really excited about this post, the prompt was: ‘all about the visuals’ and I talk all about some gorgeous chapter headers, which definitely deserve more recognition! I also reviewed The Bear and The Nightingale, which was absolutely amazing and everyone should read it. I am not saying my review is even that good, its more like flailing and screeching, but hey, not everyone is perfect. Lots of brown tones in my pictures this week, I have no idea how that happened! Also surprise guest appearance by my boyfriend’s biceps, so go check it out @deertales! Sometimes I just dedicate an hour to go through Goodreads and let myself click that cursed little, green “want to read” button with no feelings of regret whatsoever. When I went through this process this weekend, I realized there are SO many good books coming out in February, that I will never get to. But, that doesn’t stop me from admiring all the beautiful covers: admire with me! Lovely update! Glad you are feeling better friend! ❤ I am also very happy to hear Nicholas will be taking over the unboxings, because that was pure gold.